The script is perfectly prepared to achieve high positions in SERP. Very complex admin panel. It contains all of the most important functions. It enables the effective management of the site. The application allows the users to create accounts. Perfect solution for big image hosting sites. A list of albums is also displayed in the user’s panel. Next to every thumbnail representing the album, there is an information on the creation date, name, amount of pictures and number of displays. Albums can be easily deleted. 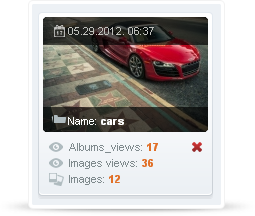 The recently uploaded images, recently created albums and account statistics are displayed on every user’s profile site. A list of uploaded pictures is displayed in the panel. Next to every thumbnail, there is an information on the upload date, number of displays and name of album to which the image belongs. The pictures can be deleted by one click. The registration is easy, quick and pleasant. There is also an option of password reminder. One just has to enter the registration e-mail, and the new password will be automatically send to it. In the panel there is a list of comments that were added to our pictures. They can be easily deleted. Every user can quickly and easily change his or her password, email and avatar.